Building smiles to last a lifetime. 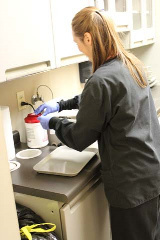 Legacy Dental Center specializes in meeting all of your dental needs. We want our patients to have a wonderful, relaxing appointment. We have a modern up to date office with many things to make your visit enjoyable. We provide televisions in every operatory for you to watch your favorite shows, and we offer nitrous oxide sedation for patients who need it. We also have a computerized charting system and are able to send your insurance claims electronically for a faster response. We are conveniently located just minutes from Huntington across the 31st street bridge in Proctorville Ohio. We offer easily accessible off street parking. Emergencies are seen promptly and new patients are always welcome. Most insurances are accepted and there are flexible financing options available. Having a healthy mouth is an important part of an overall healthy body. Feel free to contact us anytime with any questions or concerns. We provide dental care for adults and children, and would love for you to become a part of our dental family.